GOV.UK Verify is a new way to prove who you are online. It provides a convenient, secure way to access government digital services, and stops other people pretending to be you. We’ve verified more than 140,000 identities, and around 5,000 people a day are now verifying their identity and accessing services through GOV.UK Verify. Once someone’s identity has been verified, they can use their GOV.UK Verify account to access an increasing range of government services. The high level of identity assurance provided by GOV.UK Verify means that over time, the government will be able to make more services available for people to use entirely digitally, without having to use a phone or the post or attend services in person. GOV.UK Verify is in beta. That means it is in operation and available for people to use, but it’s still being developed and improved in response to feedback from users. Certified companies are constantly improving their services and we’re working with them to introduce more data and more ways for people to prove their identity. That’s making it increasingly straightforward for people to use GOV.UK Verify. As GOV.UK Verify is in beta, there are always other ways for people to access the services they need to use. In our plan to move from beta to live by April 2016, we’ve set objectives to increase the number of people who can use GOV.UK Verify. But we’ve also said that even when the service is live, there will be some people whose identity it’s not possible to verify entirely digitally. For example, it will always be difficult to verify the identity of someone who has no evidence (like a passport, driving licence, bank account) that it’s really them and not someone pretending to be them. Last week we started to trial a new part of GOV.UK Verify. Working with HMRC on the Tax Credits service, we’ve introduced basic identity accounts (also known as LOA1) alongside our existing verified identity accounts (also known as LOA2). in order to fully verify their identity account with a certified company. As part of the trial of basic identity accounts, people who can’t fully verify their identity account can now set up a basic identity account. HMRC will then ask some additional security questions and give them access to the Tax Credits service. Basic identity accounts are sufficient to allow someone to do relatively low-risk things online, like confirm existing details are correct, or save and return later to a form. Basic identity accounts are a trial, as part of our public beta, so we expect to learn and make improvements based on user feedback and data. We’ll be reporting on our progress here on the blog. You can keep up to date by subscribing for email alerts. Hi - Are there services other than Tax Credits trialling the basic identity accounts at the moment? I'm thinking specifically of HMRC's Marriage Allowance service. Yes, we're trialling basic accounts with Marriage Allowance, on a trial basis as part of its private beta. GOV.UK Verify is for individuals and by April 2016 will be the default way for them to access digital government services. Government Gateway remains for business and agents. As I cannot proceed with my application due to having a paper driver's licence, does that mean that I cannot apply until April 2016? You won't necessarily have to wait until April next year to apply. Although GOV.UK Verify cannot currently accept paper licences (as they are held on an older separate database), we're looking at providing alternatives for this issue. 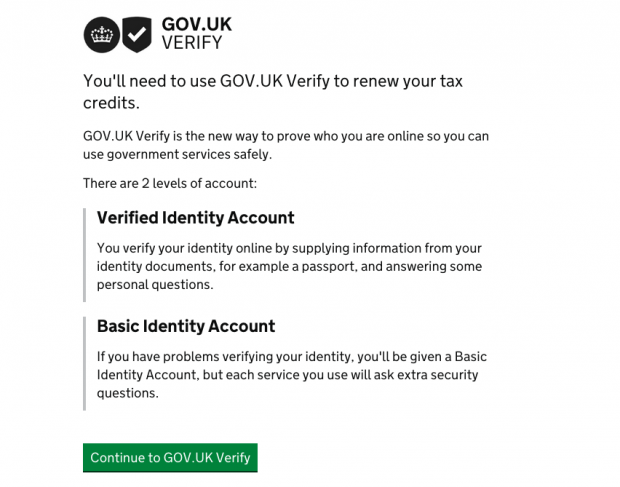 GOV.UK Verify is a new service that will allow people to verify their identity entirely digitally and use that to access an increasing range of services. GOV.UK Verify is in beta (trial), which means it is constantly being developed and improved based on feedback from people who use it. We’re not able to verify everyone yet using GOV.UK Verify - we’re working to make it possible for people to use other evidence instead of UK passports and British photo card driving licences. In the meantime, there will always be other ways for you to access services on GOV.UK if we’re not able to verify your identity through GOV.UK Verify. If you haven't done so already, please do return to the service you wanted to use and follow the guidance on the other ways that exist for you to access the service.